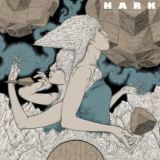 Formed by vocalist/guitarist Jimbob Isaac after the split of much-loved Welsh sludgers Taint, Hark have been subject to quite a lot of hype in the metal press since their formation in 2010. Fortunately, début full-length Crystalline has been worth the wait, the band (also comprising drummer Simon Bonwick and bassist Nikolai Ribnikov) mixing several different influences together into a coherent whole. Something like Baroness and The Melvins jamming together with a touch of Torche, Hark will please both doombahs and rock fans looking for a good crossover. Never less than listenable and often downright catchy, there's also a complexity to the songs here that will appeal to a variety of stoner fans, with frequent instrumental excursions and a willingness to jam on riffs that's downright compelling in places. It's also easy to hear a classic doom influence that creeps into some of the slower sections, such as Sins on Sleeves which brings proceedings down to a crawl in the second half. The downside to this is that this doom influence feels like a drag on the speedy, tech-stoner side of the band, and Hark are at their best when rocking out, as opener Palendromeda alone proves. Opening in fairly typical post-Mastodon fashion with groovy stoner riffs (if there's a praiseworthy trend it's that of stoner bands that can play their instruments really well) and shouty yet oddly melodic vocals, the track takes off when the band launch into wild soloing about halfway through, kicking everything up a gear and introducing a manic energy that sticks around. It's the channelling of that energy into good songs that needs work, however; nothing here is really subpar but several of the songs are so much better than their surroundings that it's hard not to think of the duller moments as, well, duller. Black Hole South West, for example, opens terrifically in a speedy stoner grind before downshifting to a slower gear, recovering some of its oomph by the end but making you wish the slower section had been cut out altogether. Thankfully, the following Breathe and Run makes up for it by upping the Melvins influence and making the doom jams feel more lively and energetic. And in fairness to the band, some of the songs which feel lifeless at first reveal their secrets with more familiarity – Scarlet Extremities, for example, a fairly average mid-paced stomper at first, but several listens later that central riff grows heavier and darker, and the song gets better. Otherwise, the only negatives about songs like Hounded by Callous Decree and All Wretch No Vomit is how truly terrible those songtitles are. Still, that's excusable even for a band with a history as long as Hark's; Taint fans may well prefer the older albums from that group to this, but as a fresh start and an introduction to Hark, Crystalline is a good album. There's even a great Neil Fallon cameo on ten-minute closer Clear Light of... that makes for a Clutch-gone-psychedelic vibe. Great stuff.